A total of 16 percent of AT&T customers indicated they would switch to Verizon if it began offering the iPhone, in a survey conducted before this week's CDMA iPhone announcement. 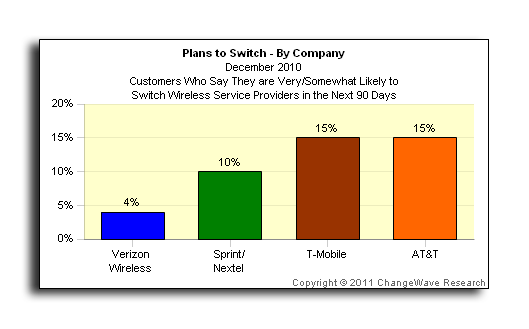 ChangeWave on Thursday released the results of a survey of 4,050 U.S. wireless customers, conducted just before this week's announcement that the iPhone 4 will arrive on Verizon's network Feb. 10. 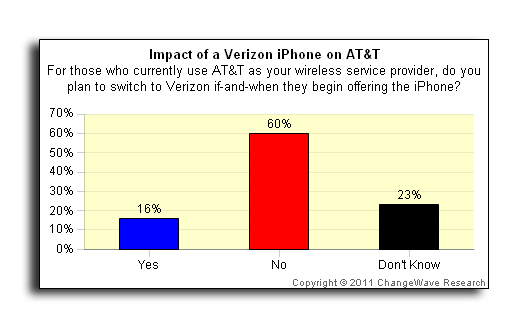 The survey indicates more customers want to leave AT&T than in any other poll dating back to June of 2009. Of those surveyed who are AT&T customers, 16 percent said they would switch to Verizon if the competing carrier began offering the iPhone. And even without the iPhone factored in, 15 percent of AT&T customers said they would switch wireless providers in the next 90 days. Solely among iPhone owners, an even higher number —26 percent —said they planned to switch to Verizon to have the iPhone on the rival network. By comparison, only 4 percent of Verizon Wireless customers said they planned to leave their carrier in the next three months. That was the best in the industry, beating the 10 percent who plan to leave Sprint, and 15 percent who want to ditch T-Mobile. Of the customers who said they are likely to switch from AT&T, 42 percent said they planned to leave because of poor reception or coverage. Another 27 percent said the reason for their departure would be dropped calls. Just 17 percent said their main concern was the cost of AT&T's service. ChangeWave said the survey shows that the launch of the Verizon iPhone is likely to have a "major impact" on U.S. wireless service providers. AT&T's exclusive arrangement for the iPhone after it launched in 2007 helped the company narrow the gap with Verizon in terms of total customers. There was one bright spot in ChangeWave's latest survey for AT&T, as respondents in December indicated they experienced fewer dropped calls on the network. Of those polled, 4.7 percent said they had experienced a dropped call in the last three months, less than the 6 percent who said they had dropped calls in September. But AT&T's dropped call rate is still higher than Verizon, where just 1.7 percent of customers said they had experienced a dropped call in the last three months. 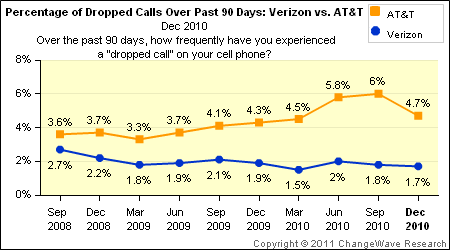 Last July, a ChangeWave survey prompted AT&T to publish internal dropped call data in an effort to defend its network. AT&T's figures contrasted those reported through the survey. But ChangeWave also found evidence last August that conditions on AT&T's network were improving, along with the reliability of Apple's iPhone. A survey of iPhone 4 owners found that Apple's latest handset experienced fewer dropped calls than those who own a previous-generation iPhone 3GS.